Real canadian superstore flyer toronto valid Aug 17 - 23, 2017. For sale 4 days only at Real Canadian Superstore Thursday, August 17 to Sunday, August 20. Get 33% off all plastick storage & fashion storage. Includes everyday essentials life at home, KIS and rubermaid Exludes clearance. Buy laundry hampers and get save money up to 25%, Hangers 50 pk save $4.00 after discount price $14.97. Life at home' frames save off 30%. 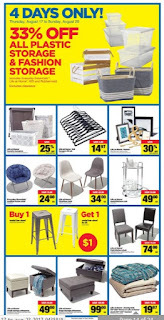 Everyday essentials padded moon chair save $15.00 Price now $24.00 ea, Life at Home Charlton chair save $45.00 after discount $34.00, Life at home metal kitchen cart save $50.00 and price after saving only $49.00 ea. Buy 1 metal bar stool you can get 1 metal bar stool for $1, Life at home 2 pk Kitchen chair available in faux leather and faux linen save $75.00 - Price $74.00 ea. Life at home small storage ottomans available in faux leather and faux linen save $50.00 Price 49.00, Large storage ottomans $99.00 (Save 100.00), LChunky knit 50"x60" throw or life at home plush 90"x90" blanket only price $19.97 ea and save $19.00. This offer is effective online or offline and in Real Canadian Superstore Stores Canada until August 17, 2017. 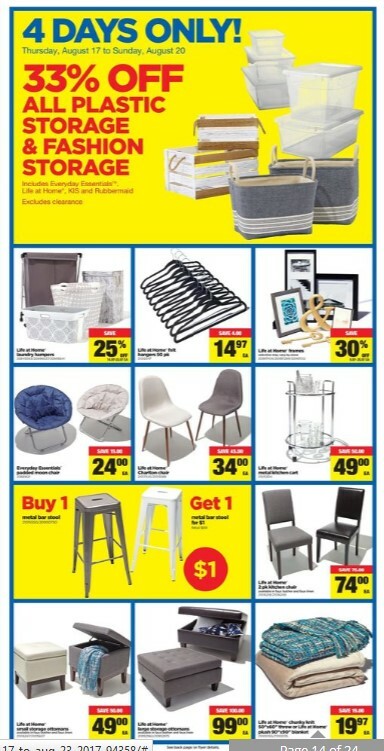 For more details and information you can click here Real canadian superstore flyer .